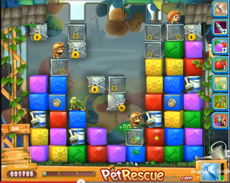 The strategy in pet rescue 520 is to create openings between the wired locked blocks (before smash the wires) in order the pets to pass and reach the bottom of the screen. So clear blocks in the lower part of the screen (to create that openings). Be careful not to encircle any pet in locked blocks, because then you’ll lose it. After that use the paint brush boosters to rescue the demanded number of pets. For those of you that find it hard to beat level 520 why don’t you cast a glance to our walkhtrough video?